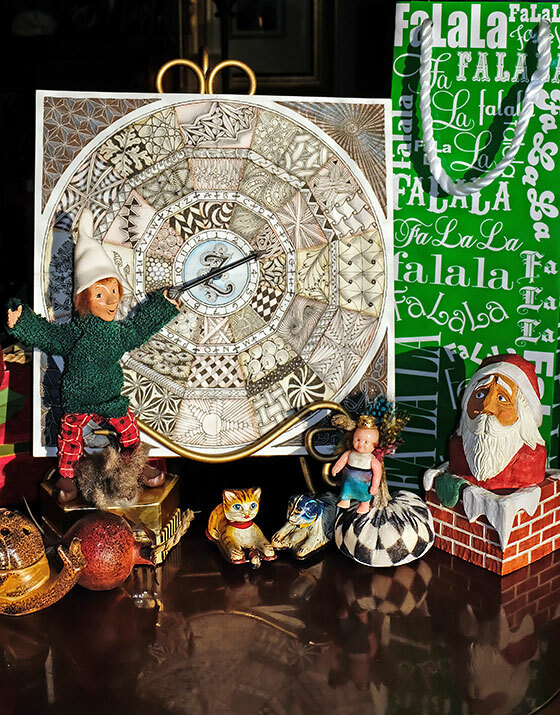 Welcome to our Celebration Day of the 12 Days of Zentangle! Alfie was so excited by Molly and Martha tangling yesterday because now he is ready for his first spin together with his friends. On this Celebration Day day of the 12 Days of Zentangle, join Rick and Maria as they assemble their spinner and have some fun. Here are the tangles and links to all the newsletters of this Project Pack #04 and 12 Days of Zentangle -- 2018 series. Celebration Day . . . Today! View all our Project Pack videos for free at our YouTube playlists. I’m home from CZT33 in Providence and still feeling “high” from all the excitement, ideas and new friendships. Happily discovered that I’m not missing directions for my Project pack 5 since the video is not out until April 12th. LOL so I found my way into the blogs and pages of previous packs and now I need to go do laundry and tangle while I wait. Thank you all again! Thanks so much for this lovely activity. It’s been a perfect way for me to reengage with Zentangle after some time away. I arranged the tangles alphabetically around the spinner and added several so all letters are represented. Wishing a wonder-filled 2019 for all of you at ZHQ! I’m FINALLY finished making my first spinner! And seriously LOLing from your celebration video discussion! I will be using this spinner often as it reminds me of tangles long forgotten! Can’t wait to start the next. Hey, I don’t have to wait! I can start it now!!! I love the new project pack 4,a Zentangle spinner. However being new to Zentangle I have a question. On the spinner there are bumpy creases. I’m not sure how to tangle over these. I would love it if others could share their experience with this. The results that other people have done that I’ve seen on the Zentangle mosaic app are just gorgeous. Thank you so much for these 12 days. I am a beginner and have one question. During the videos you always spoke of starting from the left side. I understand for a right handed person that makes sense. I am left-handed and starting from the left would mean that my hand goes across what I just drew and smudges it. I found starting on the right and going left worked much better for me. Is that all right? I had an idea, that you could use the letters and numbers as prompts for your string. I have so enjoyed this project! I’m only halfway done, but have watched the videos and am excited to finish. An excellent way to deal with the stress that is inevitable during the holidays. Thank you so much! I have a question: you mention looking up when some of the tangles were introduced in the newsletter (Tripoli), is there a way to search the newsletters? This has been such an incredible journey. It felt like i was in the studio with you, listening to you, watching you tangle. It felt like i was a part of the process and the conversation. I learned new tangles and shading techniques, and i re-learned tanfles i thought i knew. Thank you so much for this. I know that much work and love went into this project by all of you. Loved spending time with you in my studio listening to all your tips & watching your techniques. Had the best time tangling along with you all & learned a few new zentangles as well – thanks for your inspiring 12 days of Christmas – I will miss our daily get together.😍merry Christmas to all the family & a very happy new year. For 12 days I felt like Rick and Maria were not in the US but in a close neighborhood in Seoul, Korea. I’ve really enjoyed this project. I was thrilled and received a gift every day for 12 days. Thanks you for sharing your inspiration, happiness and enthusiasm. I haven’t started my project yet because I’m still waiting for my package. I can’t wait to do my own. Merry Christmas Rick, Maria, Martha, Molly, Martha and Julie! To the Z team, These last 12 days have been another wonderful experience that always brings this community closer together and is such a joy to be a part of. Thank you again for the passion you bring to this project. I am really looking forward to filling in my corners! Have been so inspired by the finished spinners on the app. So many beautiful variations! I’ve enjoyed the 12 days. Fun to see what Alfie was up to. Don’t have the project pack this time, but will think of something to do with it. Neat idea! Best wishes for Christmas & New Year. 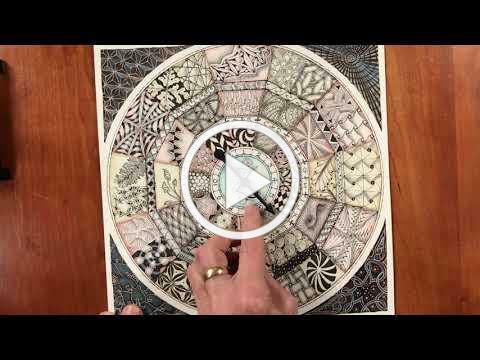 It was so much fun to start my day with Zentangle by following the video for 12 days! I love the idea to let the spinning to choose the tangles of the day. I will sure introduce this method to my students. Wow! Completed it looks wonderful, and so much fun. Love the ideas for its use and framing it, too. I had originally decided to not get the kit right away and just watch the videos, but they were so relaxing to watch (I wasn’t even tangling with you yet just watching) that by day 4 or 5 I wanted my own kit! It arrived on day 8. I was super excited and was caught up to tangle day 12 with you! Thank you! D it is over, but what a wealth of inspiration for us all. I know what I will be doing when I need quiet time over the next few weeks. Thank you so much. A lovely gift to the world. My husband was very caught up in the flow of the patterns around the wheel. He felt that your eye moves from place to place and new insights and delights are present in each orientation. This was my most ambitious Zentangle project ever. Thank you so much for this delightful series. Beautiful! I love seeing the spinner in it’s finished state. Thank you for all of the wonderful lessons. Merry Christmas to you all!